What's the proper way to clean coins? I chance upon this site - http://www.philippinecoins.com/. I learned that cleaning coins will lower their value. Any experts out there who can advise us on how to properly clean coins? Vinegar? Acetone? Soap and water? Running water? Is it safe to wipe them? Wet/Dry cloth. typically the least harmful to coins is an acetone bath. (put acetone in a dish then place coin in dish) as much as possible, i wouldn't wipe the coins since it will cause small marks on the face of the coin. What about dusty coins? Got a lot of them last week from my grandma's glass jar. Will they get damage if I leave them under the sun (to dry)? I read somewhere on this forum about using vinegar? Any thoughts? yes running water and putting them on a cloth to dry should work well. use of calamansi juice and vinegar is not recommended specially if you are forgetful like me.. it will destroy the coins if you soaked it for a long time.. this is from experience.. So let's say I use tap water to clean out the dust. How can I make the coins shiny? If it does, how long should I leave it submerged? typically with acetone, a minute or two is enough. eric hindi ba destructive ang acetone sa surface ng coin at hindi ba ito mahahalata under a magnifier? i also read that, acetone is the only cleaning solution for coins that are readily available and do not leave any mark on the coin surface.. it is used by recognized numismatist groups offering services in cleaning coins..
Tonight, on my way home, I will buy one! Tomorrow, will clean more coins from my grandma's glass jar. What happens if I leave it for 10 minutes? An hour? Why do you want to clean your coins? Because it is dirty? or dusty? or you want to make it shiny as you have stated it here? My personal advice to you is just leave the coins as is. You don't want to removed by "accident" the dirt and patina that has accumulated all those years. Value will drastically goes down due to an improper and excessive cleaning of coins more so a shiny coin due to cleaning too. Here's mine.. 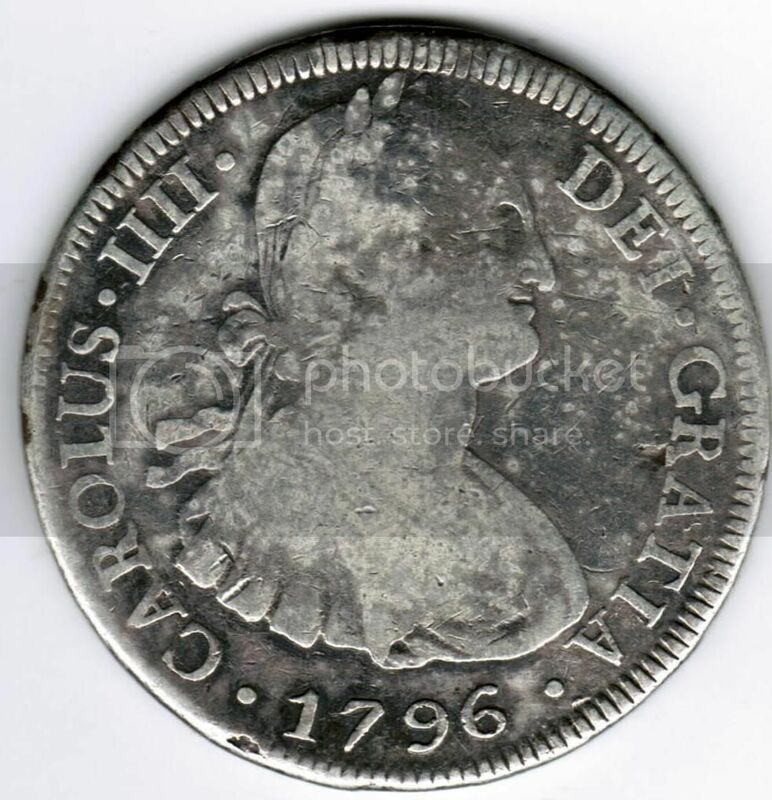 The first ever coin I have that started me to coin collecting. Bought this 12 years ago. No patina, no dirt and it is very shiny. Why? I cleaned it with a silver cleaner! I was also thinking then why this is not shiny like those new coins. So I cleaned it and nobody then was able to advice me not to do it.. Definitely, the value of this coin is way way down now. So I'm keeping this one not only for educational and historical purposes but also as a testament of my stupidity.. Hope you would learn from my experience..
, I can't see why it is due to cleaning with acetone because there's no pvc contamination in a glass jar, and if this glass jar has cover on top, maybe some minimal dust/dirt that doesn't warrant an acetone cleaning. Presently, I have 12 coins immersed in acetone for more than a week now. Trying to remove some tape residues. The acetone didn't affect the coins and the tape residues are still there. 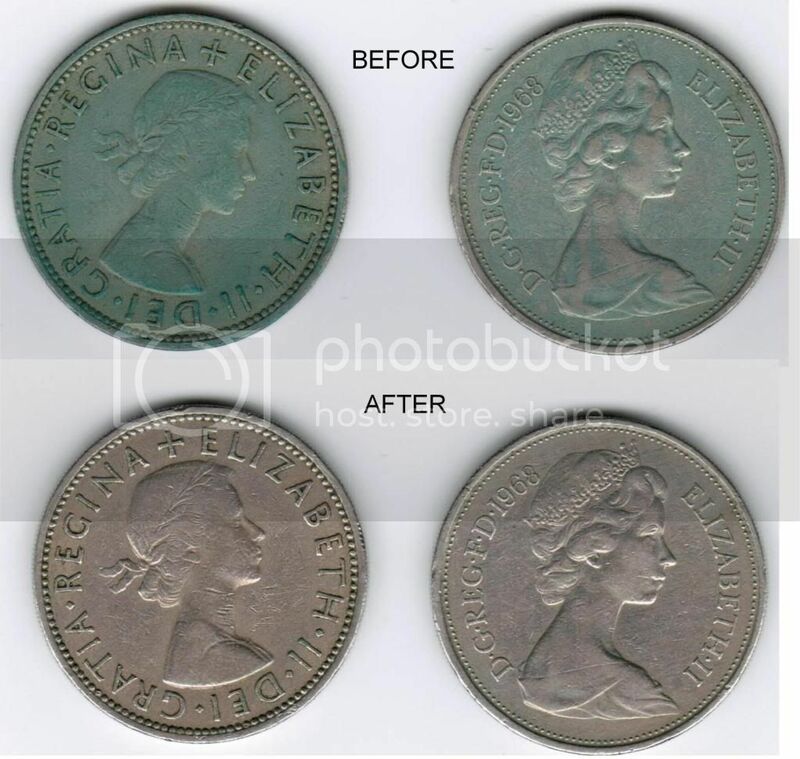 Will leave it there for another week before I gave up on this..
By the way, here's my pvc contanimated coins before and after the cleaning. It's been on my cheap National Bookstone coin album for 10 years. It's only recently I discovered these contamination. So I used acetone too. But maybe because it's been there for 10 years, the acetone was only able to removed 80% of it.. So you know what I did? I used a detergent bar to finish it! Not a very good advice but very handy when you're frustrated! So if you're decided to take those coins out of the glass jar, use either a pvc-free coin album, coin capsule or 2x2 mylar coin holder for storage and to preserve the values of your coins..
My coin album is PVC (I read here that it is if you can smell it). 2x2 mylar coin holder? Is that those cardboard thing that you need to staple? hmm... if that's the one then I can consider it. I work near SM Megamall and WORLD TREASURES has a lot of those cardboards. Currently, my coins are in those PVC albums. (I don't have expensive coins...yet LOL). I will try to seal them in those cardboards. 1) Once I put them in those cardboards. Is it safe to put them back in the PVC album? I can see collectors putting in those cardboards inside albums (not sure if theirs is PVC free). x2 mylar coin holder? Is that those cardboard thing that you need to staple? yes that's the one.. well, if you will visit the World Treasures maybe you could share to us( specially to me ) how much is the 2x2 mylar coin holder now and whether they have a website.. I'm from Mindanao and it's really hard buying these mylar holders here. actually, i have a couple of coins enclosed in mylar holders on a pvc album. so far, wala namang problema. BUT one expert explicitly insisted on the usage of pvc-free album even if the coins are in a mylar holders, especially if these are copper and bronze. I will ask someone further about this scenario - mylar on a pvc album..
" I tested both out going through alot of new coins and in the end you sweat in either glove if you wear them for long periods of time. I found it's best to use both at the same time especially if you are looking at alot of coins or will be wearing them for 15 minutes or more at a time. Wear the latex glove under the cotton glove. The latex one stops sweat getting through to the coins and the cotton glove stops the latex gloves from making contact with the coins if you are worried about that. I've never had a problem using this method." First, a couple comments. Earlier in this thread someone referred to "recognized numismatist groups offering services in cleaning coins." I know of not a single, reputable numismatic organization that sanctions or encourages cleaning of coins. In addition, experience suggests that all approaches to cleaning carry at least a risk of unintentional damage to coins. Even cleaning with soap or acetone can cause damage, especially if the cleaning agent is left in contact with the coin surfaces for too long. The references to acetone are the main reason I wanted to reply. If you insist on using acetone to clean your coins, I recommend purchasing it from a hardware or drug store, but avoid using "nail polish remover." Nail polish remover contains a relatively small amount of acetone, combined with other ingrediaents to make it less flammable and less harmful to nails and skin. I would avoid using anything other than pure acetone for coins. I just bought 3pcs "Young's Nail Polish Remover" at 7php each last night. I did not know that there's a difference. Whew! Thanks for the information by the way. Will do, will let you know in a week. For the record, I'm not a chemist, but the problem with nail polish remover instead of pure acetone is simple: If it contains ANY acetone, that ingredient is diluted with oils. Many nail polish removers contain very little if any acetone. These have a substitute compound known as ethyl acetate. As I said originally, I'd be very careful, and make sure you buy only pure acetone. Substitutes for acetone have been introduced to avoid intentional acetone inhalation, and I will leave it at that. i agree that any sort of cleaning risks exposing your coins to possible damage. i use acetone to clean coins with signs of pvc contamination because i personally believe that i am better off with a coin that has taken an acetone bath as compared to a coin with long term pvc contamination. This is the acetone that I have been using of.. 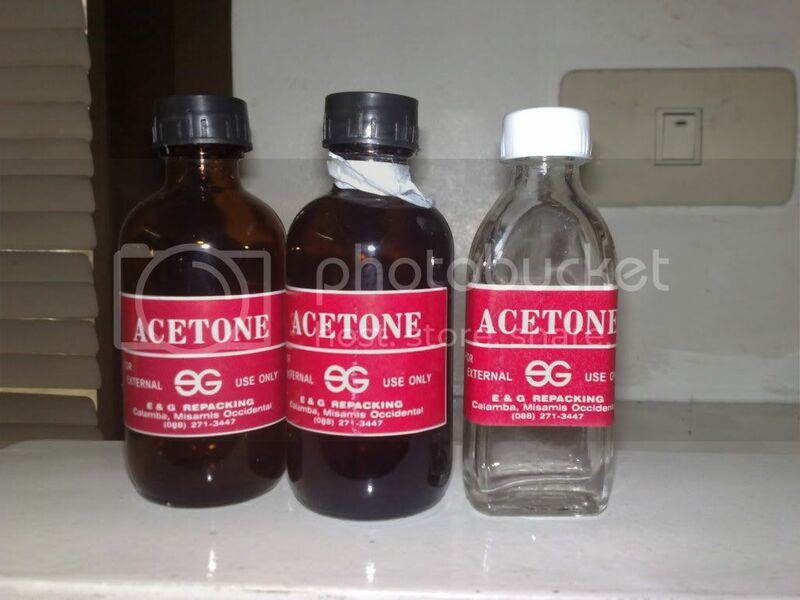 I don't know if you could buy a pure acetone there in Metro Manila because EricGo had a hard time looking for it. I would also like to warn you to be very careful when using this product. Always have a good ventilation. The liquid is so volatile and very flammable. And even if the bottle say "pure Acetone", always test it. I always test my acetone to be sure. I pour some acetone on a ceramic bowl, and let it evaporate. If there's some residue that are left over, then this is not a pure one.. Don't use this. A good one will leave no residue on the bowl. I just used the ones I bought. No residue, so is it pure? I will buy those, will look for them at hardware stores. > Acetone bath did not make my coins shiny (normal coins - not gold/silver). > Acetone bath immediately cleaned my coins with "pentel pen" damage. (As soon as I drop the coin it removed the pentel pen stains hahaha LOL, I was really amazed). > Acetone is really cold (I accidentally spilled some on my hands). > They also smell really strong. why don't you post some pics for all of us to see?